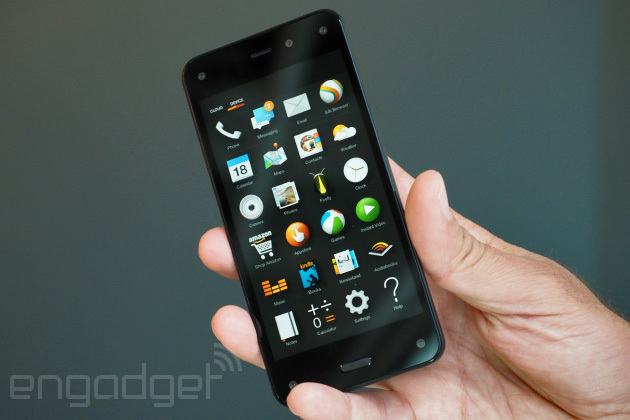 It was only a matter of time before Amazon launched a smartphone. In the past 10 years, the company's extended its reach from the online realm into physical hardware, and after the addition of the Fire TV recently, the smartphone was the last major device genre it hadn't explored. Amazon's filled that void with the Fire phone, an AT&T-exclusive smartphone that ships in late July for just under $200. CEO Jeff Bezos spent over an hour on stage discussing the new phone's litany of features and how its uniqueness gives it an advantage over most other handsets the Fire phone will compete with. It's true: No other devices have six cameras and quick access to tech support, and features like Firefly and Dynamic Perspective help give the device a flavor of its own. In a crowded smartphone industry, differentiation is critical. 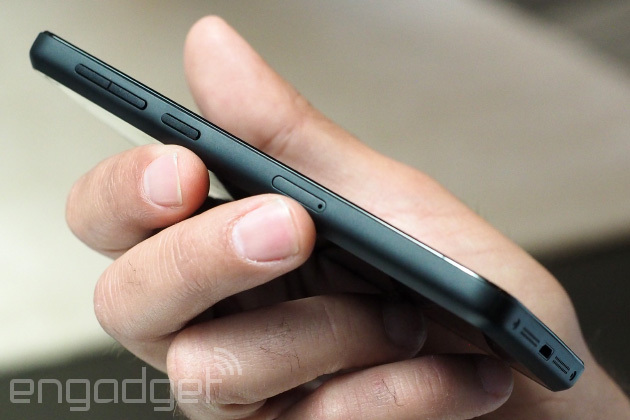 Devices that don't have any stand-out features won't get noticed amidst the rest of the noise. Fortunately, Amazon's got nothing to worry about here, but a fancy onstage presentation doesn't always translate into actual user experience. Let's take a closer look at the Fire phone to see if our initial impressions match what we saw at today's announcement. 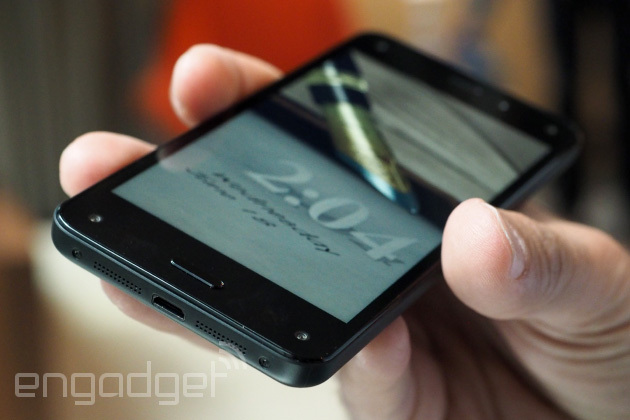 Excepting the five cameras on the front, the Fire phone looks like an average device. In many ways, the build reminds me of the Nexus 4: Gorilla Glass adorns the front and rear, and the plastic sides reach slightly around the back. With a 4.7-inch display, I had no problem handling the phone -- Bezos was adamant that this size is optimal for one-handed use, and although I prefer slightly larger devices, Amazon believes that this size is the "sweet spot" for its users; not too large, but not too small. Its 8.9mm thickness doesn't make it too bulky, and the back is narrower than the front, so my hand wrapped around it pretty easily. About those five cameras? Being accustomed to a single front-facing lens on the vast majority of smartphones, a lens for each corner gives the phone a weird look. If you already feel like Big Brother is watching you, the fact that five eyes are looking at you when you use the phone probably won't ease your worries. Of course, they're there for a reason: One of Amazon's unique offerings is its 3D-like Dynamic Perspective feature. The cameras take on a Kinect-like role by looking at where your face is positioned, and how far away it is from the phone. Even though it only technically requires two cameras to do this job, Amazon opted for four just in case some part of your body obstructs one or two of the lenses. It works as advertised. A lock screen showed a balloon with mountains in the background, and as I moved my head from one side of the phone to the next, I felt like I was peeking around that balloon. This will also come in handy for games: There was a game where I was a snowboarder, and my body moved in the direction that my head moved. I could also lift my head up to make my character do a jump. This could be a fun idea in theory, but it'll take me a lot of getting used to; each time I moved my head, my hand naturally moved the phone with me, which defeated the whole purpose. Users with motion sickness will not like the Dynamic Perspective option. It reminds me of the parallax motion on iOS 7, a feature that frustrated a fair number of iPhone and iPad users. Fortunately, Amazon will let you turn this feature off, but execs believe it's an essential part of the experience. Rob Williams, VP of software, said that customers should be able to do what they want with their phones, but it's such an important feature that he doesn't know why anyone would want to use the phone if that feature is turned off. Firefly is another critical selling point for Amazon. It's not unlike most QR code readers out there, but it can read several types of information and give you relevant details about that info -- and it ultimately stands to be Amazon's cash cow, since many of the products you scan will give you a prompt to buy it through the retailer's service. As Bezos claimed in his presentation, Firefly indeed does a great job of overcoming glare; I successfully scanned a CD even though the cover had so much glare that my human eyes couldn't even figure out what it said. It also does a good job picking up movies, TV shows and music, but I was disappointed to find out that it wasn't able to understand a song when I sang it. Another area in which Amazon is trying to be different is its use of gestures to navigate through its three-panel design. Flick the phone to the right to pull up a list of Amazon's services and features; flick it to the left to get something reminiscent of a notifications panel, which offers upcoming appointments, messages and other relevant information. Slight tilts in either direction trigger what Amazon calls "peek," which lets you take a quick look at the date, time, battery life and signal. A swivel-motion gesture brings up a fast-access screen that can get you into settings and other basic tools. Granted, you can use your fingers to pull all of these menus up, but it's handy when you absolutely have to hold the phone one-handed. The software is Fire OS 3.5, which is a forked version of Android 4.2 Jelly Bean (or the AOSP, at least). However, Williams insists that there's very little relation between the two, primarily because Amazon has made so many adjustments of its own that it has plenty of different features and new user interface elements on top. As could be expected, Google Play Services won't be offered on the Fire phone, but there should be a way to sideload APKs. A press of the home button will let you switch back and forth between the app grid and the carousel. The carousel gives you the ability to look at frequently (and recently) opened apps, and each app can list off some recent notifications -- for instance, the USA Today app shows breaking news stories; the email app shows recent emails; and the calendar app offers up your next appointments. As for the app grid itself, you can put apps in whatever order you want, as well as add extra content like books, websites and other specific items. Oddly, the Fire phone won't launch with Bluetooth LE, though Williams confirms that the hardware does support it. This likely means the phone will get updated with software support for the spec eventually, but Amazon couldn't give me any official confirmation on when this will take place. And this is going to be a huge negative for anyone who owns (or is thinking about buying) wearables, since many of them rely on Bluetooth LE to connect to the phone. For a flagship product launching in 2014, this was a bit of a surprise. Spec-wise, it isn't the most impressive phone, despite commanding a $199 price tag on-contract ($650 off-contract). But it's not horrible either -- it's simply what you'd expect from an average phone. Of course, Amazon's focus is on what makes it unique; the gestures, imaging prowess, Dynamic Perspective and Amazon services are differentiating factors that it can boast over other smartphones. Its exclusivity with AT&T limits the number of people who will want to buy the phone, unfortunately, and Amazon isn't interested in selling it as a WiFi-only device. "Using a phone as anything other than a phone isn't realistic in today's world," Williams said. That said, he also emphasized that this is just the beginning: While he wouldn't confirm any future products, he said that Amazon didn't invest multiple years into these features for just one device.